Another recipe from Joy of Cooking. Saute mushrooms in butter until lightly browned. Add remaining ingredients and simmer 20 minutes. Blend. An immersion blender works well, but a standing blender or food processor works too. In an ovenproof saucepan melt 2 tablespoons butter. Stir in 2 tablespoons flour. Slowly add 1 cup milk, stirring well. Add 1 small onion studded with 2-3 whole cloves and 1/2 small bay leaf. Stir until the sauce thickens. Place in a 350F oven, uncovered for 20 minutes. Strain the sauce and stir into the blended mushroom soup mixture. Heat slowly, but do not boil. Season with salt and paprika. Ok, this was supposed to be stuffed Acorn Squash. 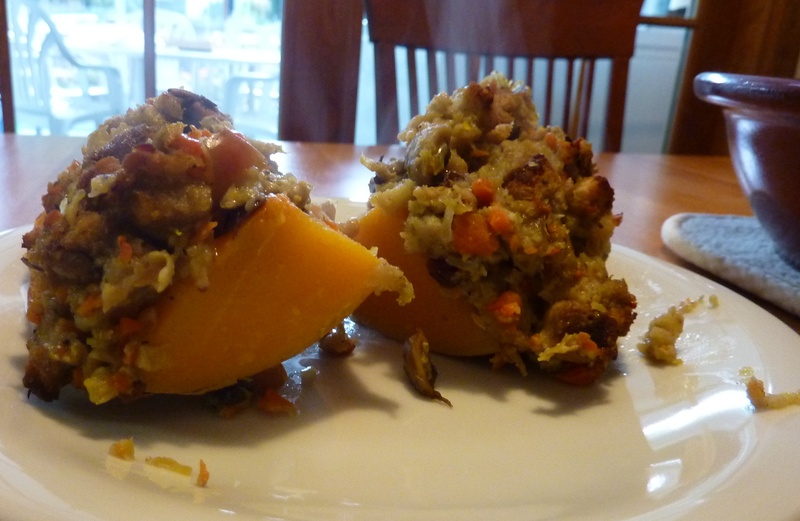 Morgan likes acorn squash and she wanted bread stuffing. I got the stuffing ready to go, cut open the squash and it was completely rotten. I did however have a butternut squash sitting on the counter so…. This isn’t really anything new. It is basically the same recipe as Stuffed Acorn Squash but with bread instead of rice, and a different squash by circumstance. Morgan at least liked the stuffing. Heat 2 tablespoons butter in a large skillet. Saute onion, carrot and celery until softened. Add apple, craisins, Bell’s seasoning and pepitos, salt & pepper and cook another minute or two. Add the sauteed vegetables to the soaked bread cubes. Stir in one egg to hold the the mixture together. Salt & pepper the insides of the squash and pile on the stuffing. 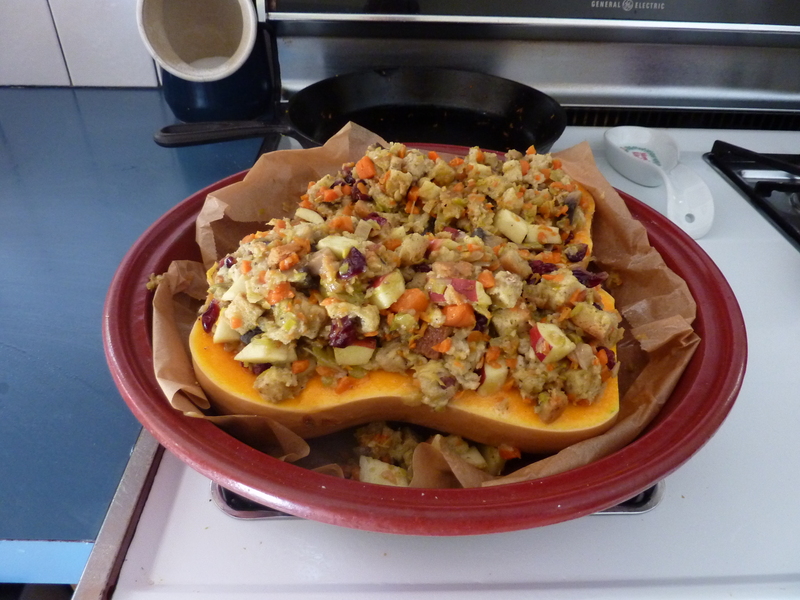 Place the squash halves in a baking dish, cover and bake at 350F until the squash is cooked through – about 1 1/2 hours. This recipe comes to us from one of my daughter’s best friends, Gen. My thanks to the Wickizer family. Beat together the first 4 ingredients. Pour into a large, greased and floured cookie sheet with 1-inch rim. Bake 20 minutes. Remove from oven and immediately spread with the peanut butter. Refrigerate until cool. Melt the chocolate and spread on top. Refrigerate until cool, cut into squares. This recipe is adapted from Joy of Cooking. Dredge the chicken in flour seasoned with salt & pepper. In an ovenproof skillet or dutch oven, brown the chicken in 1/4 cup of butter or oil, set aside. Simmer to deglaze the pan. Add the chicken. Bake at 350F uncovered about 40 minutes until the chicken is tender. During the last 5 minutes of cooking add 1/4 cup raisins. Garnish with sliced almonds and serve with boiled rice. I have long wanted to turn this into a vegetarian recipe but nothing can quite replace the overall flavor of the chicken. However, the last time I made a pot of chicken soup I had a cup of leftover meat. So I used that, half a head of cauliflower and a diced potato in this recipe. It worked very well. Not exactly vegetarian but it made the most of a little bit of meat. This recipe comes from Mastering the Art of French Cooking, the famous cookbook by Simone Beck, Louisette Bertholle and Julia Child. New York: Alfred A. Knopf, Inc., 1961. This is a dry marinade and the flavors are strong. My family and I love it. My brother and younger sister do not. Mix all the ingredients together and rub into the pork. Place in a covered bowl and refrigerate. The directions say “Turn the meat 2 or 3 times if the marinade is a short one; several times a day if it is of long duration.” I usually reserve this marinade for a pork roast of no more than two pounds. So the larger the piece of meat the longer the marinade time. I myself have never left it marinate more than 24 hours. Scrape off the marinade and dry the meat thoroughly before cooking. My mother was Polish by descent but Italian by love. I am fairly certain she learned to make Ravioli from my Noni. I don’t understand how this recipe was missing from her collection. These directions make a large batch. We use a ravioli rolling pin to form the ravioli. These pins are readily available on Amazon. My Noni’s pin make small, 1-inch ravioli, Mom’s makes larger ravioli. Choose based on how much cheese to pasta you like. Place the flour in a mound on the counter. Make a well in the center. Break the eggs into the well, add in the oil. With a fork, whisk the eggs and slowly bring in the flour, being careful not to break through the sides of the flour. Once you have as much flour in as you can manage, knead the dough. You will not be able to get all the flour to combine into the eggs, don’t even try or it will be very stiff. Knead the dough until smooth and elastic, a finger print pressed into the dough should pop back out, about 10 minutes. Lightly oil a bowl large enough to hold the dough. Place the dough in the bowl and roll over to coat with oil. Cover with plastic wrap and set aside to rest for 15 minutes. In the meantime mix the filling. Combine all the filling ingredients in a large bowl. Set aside. To form the ravioli, cut off a piece of dough and roll until very thin, almost translucent. We have a large board that we work on and you can see the grain of the wood through the dough. Fold the dough in half to mark the size, open. Spread a 1/4″ layer of cheese over half the dough. Fold the half of the dough over the cheese. Using a ravioli rolling pin, roll over the dough. This will mark the shapes and from the ravioli. Use a rotelli or pastry cutter (this looks like a pizza cutter but the wheel has wavy, fluted edges) to cut out the ravioli. This should also pinch the ravioli closed unless you put in too much cheese, something I do to at least one sheet! 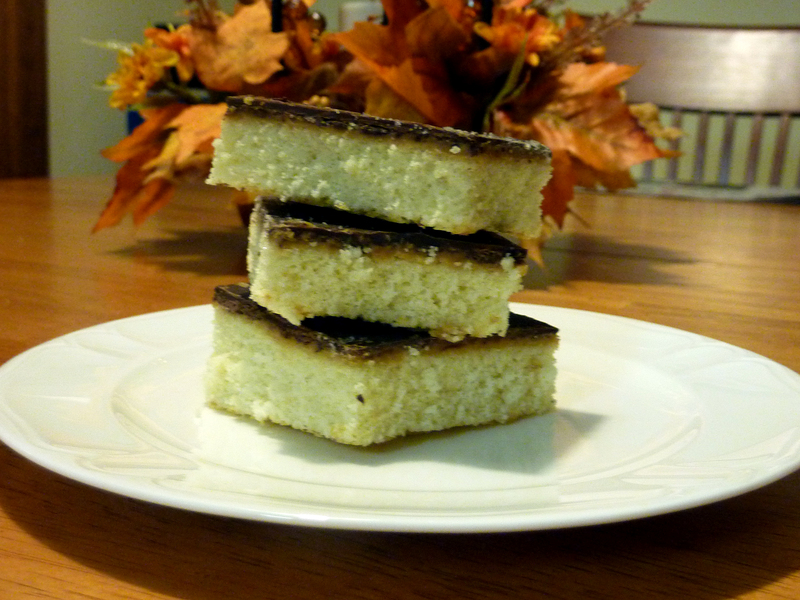 Dust cookie sheets with cornmeal. Place the ravioli on a cookie sheet in a single layer. Place sheets in freezer until frozen then remove to plastic bags. To cook, boil in salted boiling water about 20 minutes. For my daughter Morgan who will soon be moving out on her own and will have to cook. Here are the basic directions for making cream broccoli or for that matter any vegetable you feel will benefit from milk and cheese. Grandma used to make creamed carrots to accompany meatloaf when I was a child. Lightly grease a 2 quart baking dish. Steam the broccoli and place in the dish. In a medium saucepan over medium heat butter and oil. Add the onion and saute until translucent. Stir in the flour and cook a minute, do not allow the flour to brown (this is a roux). Add the milk slowly, stirring constantly to mix into the roux. Cook stirring occasionally until thickened. Remove from the heat and stir in the salt & pepper (white pepper looks nicer) and the cheese. Stir until the cheese is melted. Pour over the broccoli. Top with toasted bread cubes if desired. Bake, covered, at 350F for 20-30 minutes. The reason this always shows up on our holiday table is that it can be made ahead up to the point you need to bake it. Bake until bubbly, about 30-40 minutes. I made this recipe up, so in true Sian fashion it is really just a list of ingredients. Heat 2 tablespoons butter in a large skillet. Saute onion, carrot and celery until softened. Add minced garlic, craisins, Bell’s seasoning and pepitos, salt & pepper and cook another minute or two until the garlic is fragrant. Add the cooked rice and enough applesauce to moisten the mixture up and hold it together. These may also be cooked in a slow cooker but I can only fit one squash in mine. Add 1/2 cup water to the bottom and cook on low heat for 6-8 hours.